Want a Proven Tool That Will Improve Your Work Performance? Have you ever wondered why some people think faster, show more creativity, and have a good memory? These people are more confident and they achieve their goals without much difficulty. Now you can be like them. Learn Mind Mapping, one of the world's most powerful thinking tools, and start making your life and career more successful. 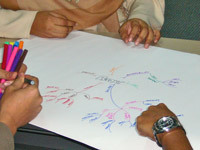 At the Mind Mapping workshop, you will learn how to use mind maps to organise your thoughts, remember more effectively, write better reports, make quicker decisions and boost your productivity. The workshop will give you the knowledge and applications to improve your work performance, making you a more effective manager. Managers, executives and business professionals who want to improve their thinking skills and personal productivity, and become more successful in their careers.